1960 photo. As an image of how the building might have looked in the 17th Century this is misleading in one important respect: there would have been no cowl, only a vent hole in the roof. 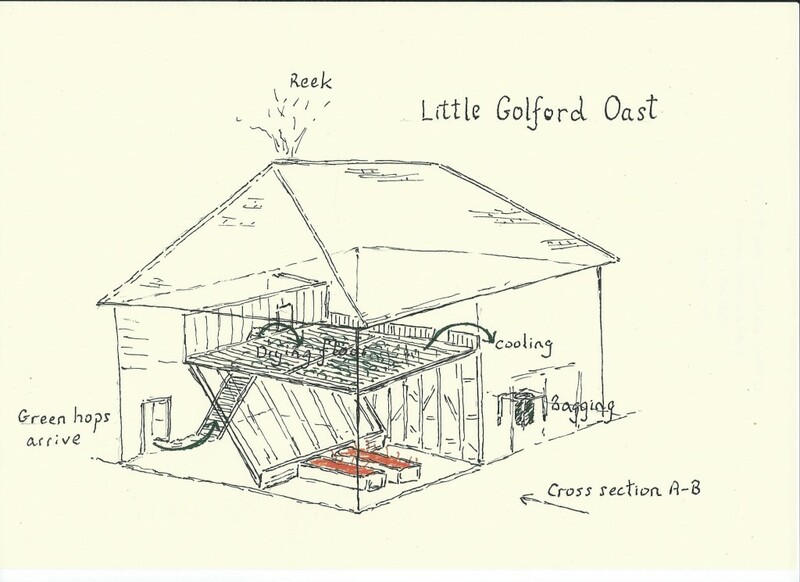 The oast at Little Golford, east of Cranbrook, (TN17 3PA) appears to be the most authentic surviving example of an early oast, closely mirroring the 16thCE building described by Scot in size and layout. 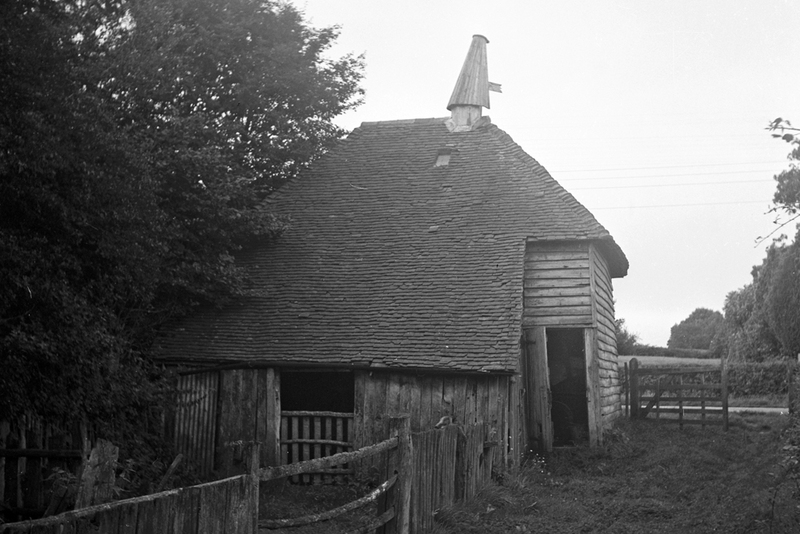 In 1960 its significance for the history of agricultural buildings had not been identified in previous literature. It was owned then by 84 year old Mr Santer whose family had been drying hops there for generations. The interior was as it had been when hop drying ceased in the 1923. This three dimensional diagram (2016) shows how the oast operated. 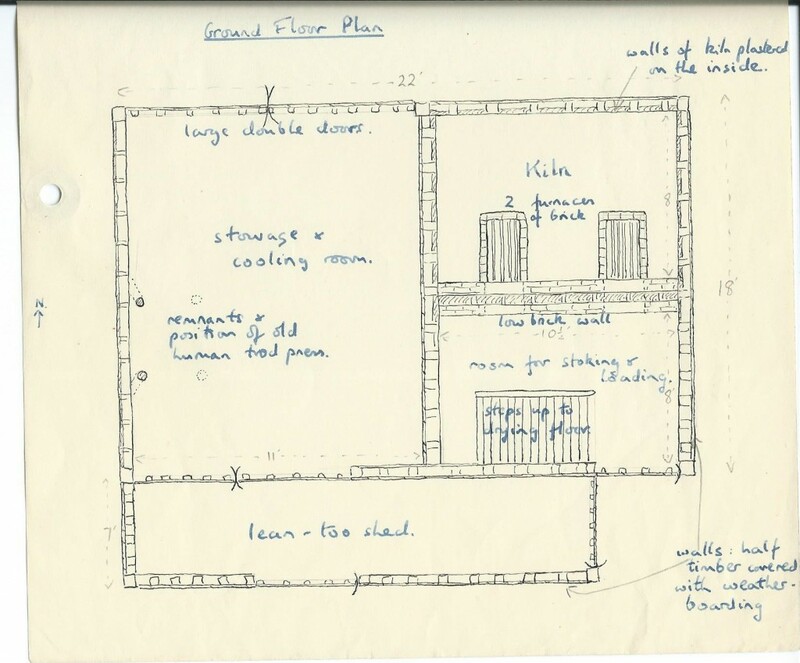 The line of the 1960 cross sectional diagram (below) is shown and the two 1960 floor plans (below) relate to the ground floor and drying floor level. The viewpoint is the same as the modern photograph below taken from the roadway. The floor was made of Kentish rag stone slabs, some up to 2 ft wide. The only brick in the building was the two open fire places. The timber structure was much the same length as Scot’s model: 22 feet compared to 19 feet. But it was more than twice as wide, 18 feet compared to Scott’s 8 feet’ This allowed space for a loading floor separate from a drying floor. The hops had to be carried up a steep ladder to a small first floor balcony for loading onto the drying floor. The drying floor was quite a good size, 10 x 12 feet. It was only about 5 feet above the top of the two furnaces which in all probability would have burnt charcoal. In the cooling area were the remains of the support structure for bagging up the hops with a man standing in the sack to press them down. The cowl would have been a later addition and in 1960 it dated from the early 20thCE. 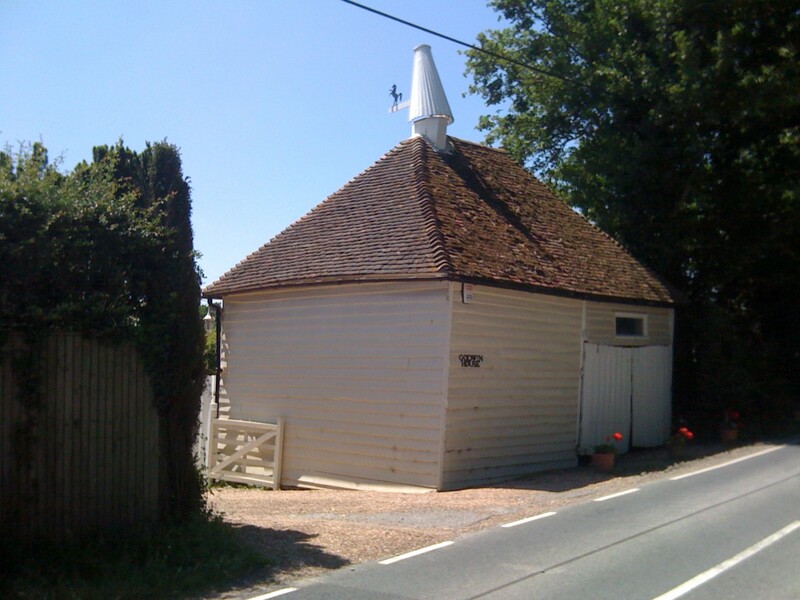 It is likely that much of the oast was built with recycled wood. 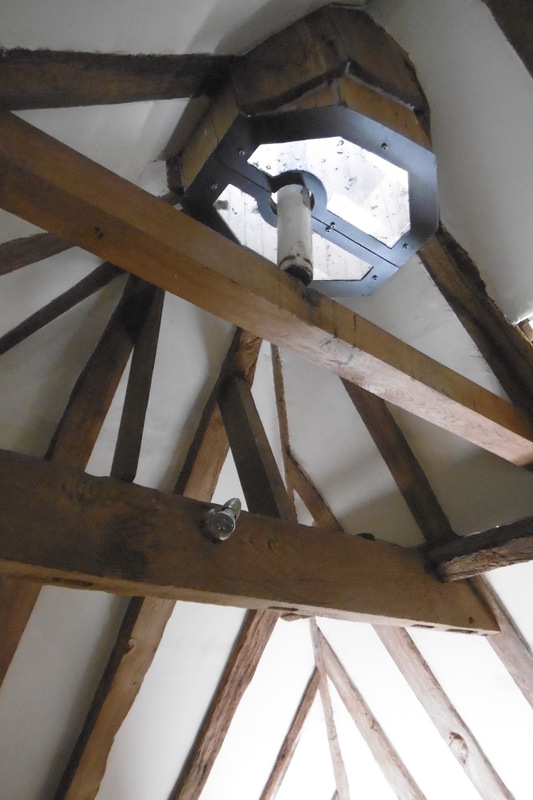 One timber had a date 1690 on it. 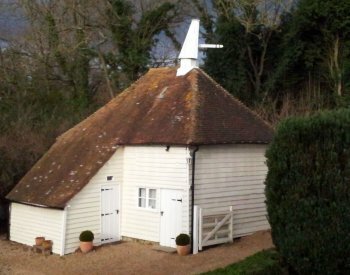 In recent years the oast has been described as dating from the 1740s. However by the mid 18thCE oasts were being built with larger kilns and with a cooling room on the first floor. It seems unlikely that such an uneconomical and inefficient oast of anachronistic design would have been built then. The evidence points to Little Golford dating from some time in the 17thCE. The adjoining house is dated 1580. There are references in Cornwallis family Estate documents of 1688 (Kent County Archives) to an oasthouse at Golford. 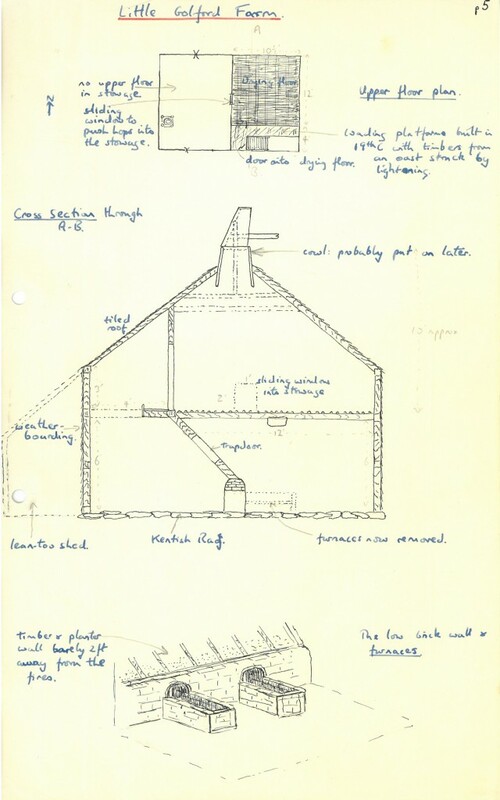 Could the oast have ben built at much the same time as the house, soon after Reynolde Scott wrote his book? 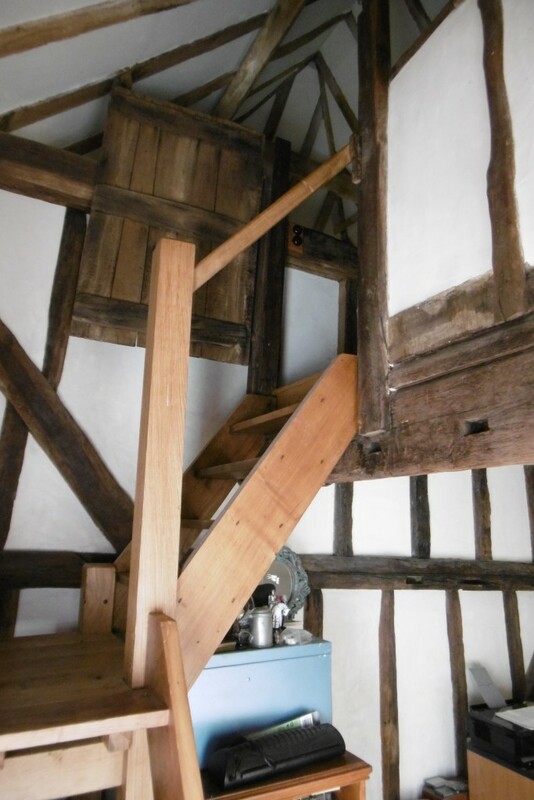 The 2015 photographs below show the carefully restored exterior and interior, including the vent above the drying floor and the modern steps up to the drying floor.